Last night, referring to the nine (so far) suspicious packages, some of which have included pipe bombs, that have been sent to his critics, Trump momentarily pretended to act presidential, saying, "Those engaged in the political arena must stop treating political opponents as being morally defective." And yet, within the last week, according to NPR, he revved up a Texas crowd with the tired mantra, "Lock her up!" and called Maxine Waters a "low-IQ individual, and in Montana fantasized about a fight with Joe Biden, saying "He'd be down so fast." But, sadly, and as we all know, last week wasn't an anomaly. 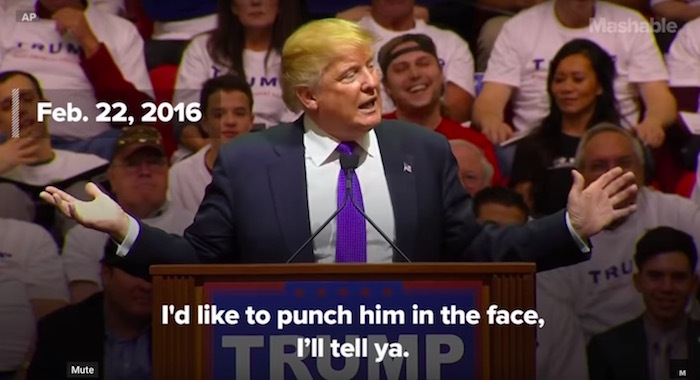 The above montage of the many instances Trump has welcomed violence with relish is a disturbing reminder of what a thug our "president" truly is. Even more disturbing is the fact that the video is from March 2016 – I can't imagine how long this montage would be if it were made today.